Homeowners often decide to install timber decking for the beautiful environment it creates, and the vast types of properties it can suit. When considering decking, homeowners often assume that timber is the best (or only) type. 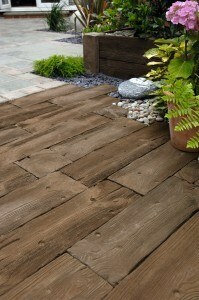 However, another great choice is composite decking. Composite is made from polyethylene, wood flour and additives that stabilize the plastic and protect it from UV rays. There is a stigma that composite can look fake, but this is not true; this kind of decking is available in a variety of wood toned or painted finishes and can be a perfect replica of natural timber. Both timber and composite decking have many benefits. Timber has the benefit of having a natural appeal, and can be stained and painted to suit your needs. However natural timber does require some maintenance. Composite has the advantage of having a very strong resistance against rotting or insect infestation. What’s more, it never needs painting or refinishing meaning it is very low maintenance. Although, if your deciding factor is how environmentally friendly the product is, the truth is that arguments can be made for both products. Timber is a renewable resource, especially if you choose timber from a plantation that isn’t of an endangered species. The process of producing the timber decking is said to be more energy efficient than the process of manufacturing composite. Composite decking is made from a combination of timber fibres and plastic, and the manufacturers claim that it is a better alternative to timber as they aren’t chopping down rainforest or plantation trees, instead they are using sawdust and other timber bi-products. At some manufacturers, some or even all of the plastic comes from recycled plastic. To find out more about what services we can offer you, call 02380 434231 or email becky@auralandscapes.co.uk today!